In December 2017, Christopher Charalambous travelled to Miami to join in celebration, all newly promoted students at Valente Brothers. Students from all over the world attended the ceremony, some are well known like Royce Gracie, Angela Gracie, Crosley Gracie and Alistair Overeem. Pedro Valente started the ceremony with a speech. Then, he announces all the new promoted students. First, all Four stipe white belts are promoted to blue. Therefore, as a result begin their Journey to black belt. Next in line are the blue belts. If ready they are promoted to purple. Therefore has reached the advanced stage. Purple belts are next, they will be promoted to brown. This is a prestige rank and whoever achieves this rank should be honoured. Christopher’s name is called, and as he stands in front of hundreds, the purple belt is removed and is replaced with a brown. 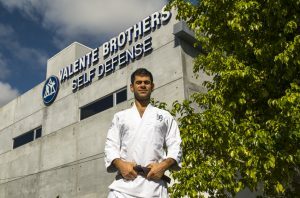 As a result, Christopher is now Valente Brothers Jiu jitsu highest rank in the United Kingdom. Black belt promotion is where we finish. Just because you made it this far, doesn’t mean you are guaranteed to receive the rank of black belt. In fact, to have a chance of achieving this rank you must be invited to take a test in private. Only black belts that have taken the test know what happens behind close doors, and each student that participates is sworn to secrecy. Lastly, Christopher would like to say a few words, “Thank you to all that have supported me, I’m truly honoured to be a brown belt. Without my friends in Miami pushing and helping to keep me focused, this wouldn’t be possible. To my family and students here in the UK, thanks for standing by me”.